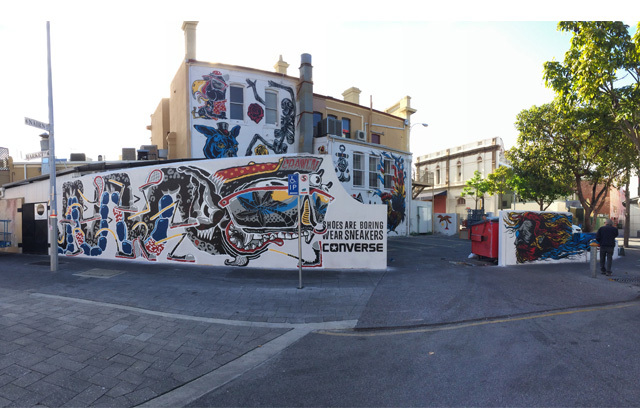 Late last week the Yok, Sheryo and Alex Le Hours converted a grey, non-descript wall in Fremantle into a canvas for various different quirky characters and imagery inspired by entries from punters worldwide for the Converse Sneakers Clash Wall project. Submissions were made via social media with the #sneakersclashfreo hashtag and from that the artists interpreted them into vivid designs that disrupted the blank space in the Perth suburb. The mural was in response to the Chuck Taylor All-Star ’70 pack, which is a reissue range of the classic Chuck in the original fabrication and colourways from, yup – you guessed it, 1970. See the wall in the gallery above. And read our interview with Sheryo and The Yok here.